Learn to work intarsia colorwork with Sharon! 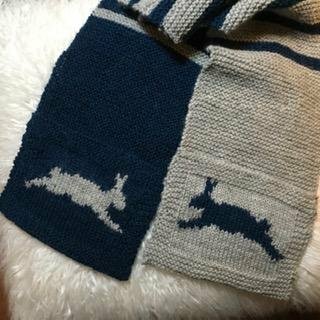 You will use Sharon’s “Runny Rabbit” pocket scarf pattern (available from ravelry.com) and worsted weight yarn to knit an adorable scarf. There is homework, so sign up early! Student must get gauge detailed in pattern to determine knitting needle size needed and work Rows 1 - 9. Bring this to class with you along with all materials and pattern. Must be at least an intermediate knitter. Must be able to cast on, knit, purl, bind off confidently and without help. Materials To Be Brought to Class by Student: 1. Must purchase ?Runny Rabbit? scarf pattern by Sharon Mooney (available on ravelry.com) 2. One skein Berroco ?Ultra Wool Fine? (100% Superwash Wool, 400 yds/366m, 3.5 oz/100g), color 53108 (called grey in pattern)-Available at HOKC 3. One skein Berroco ?Ultra Wool Fine? (100% Superwash Wool, 400 yds/366m, 3.5 oz/100g), color 53152 (called navy in pattern)-Available at HOKC 4. 24?/60cm size US 7/4.5mm circular knitting needles 5. Yarn needle or large embroidery needle 6. Tape measure Mandatory Homework : WILL NOT BE ADMITTED WITHOUT COMPLETED HOMEWORK Student must get gauge detailed in pattern to determine knitting needle size needed and work Rows 1 - 9. Bring this to class with you along with all materials and pattern.